Terrorism of the most foul and devious kind. Families are left destitute, towns destroyed and livestock slaughtered. 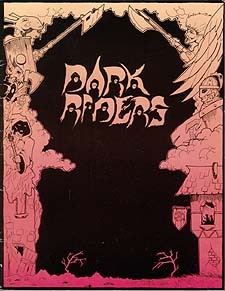 All the work of a frightening and ephemeral group known only as the Dark Riders. Markstrand, where Dark Riders takes place, is one of the most settled areas of Dolphinia. It conceals seething political intrigue, and a few who lust to overcome a popular leader through deceit, coercion, and violence. In addition to the adventure itself, Dark Riders contains Markstrand, and overview of a Dolphinian county. People and Places includes nine detailed maps and stats for twenty-three of the most important and interesting characters. Adventure Seeds briefly describes eleven more adventures lurking just around the next corner. Skills introduces one new skill, woodcraft, and details another, herbalism. Included are Encounter Sheets for characters most likely to be met in combat.